bareMinerals Blemish Serum Review(2018):Worth Buying? What Is BareMinerals Blemish remedy Serum? This product helps you better manage your excessively oily skin and regulate oil production. This product controls skin shedding, making the cycle of skin renewal longer so as to prevent your pores from getting constantly clogged by flaked skin. The formula helps facilitate skin turnover and renewal, allowing less damaged skin to surface and replace the old, top layer. This product is designed and formulated by Bare Escentuals which first became known for its mineral foundation and mineral-based cosmetics line before the brand ventured into skin care. 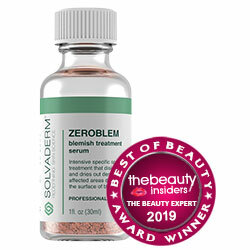 Salicylic Acid: Facilitates faster skin relief and treatment from acne by regulating skin shedding, controlling excessive oil production, drying out blemishes, and facilitating skin turnover to reveal newer, less damaged skin, as it also helps maintain clear, blemish-free skin once acne is cleared. Moreover this product can lead to peeling of skin and rashes. Zinc: Clears skin from acne-causing bacteria, including the ones that have developed resistance to antibiotic treatments, while simultaneously protecting your skin from inflammation caused by acne-causing bacteria. Licorice Extract: Has natural anti-inflammatory properties that facilitate faster healing of irritated skin, and also has natural astringent properties that help lighten acne marks and show off your brighter skin complexion once again. Meadowsweet Extract: Has natural anti-inflammatory properties that helps heal your skin, improves skin synthesis, and moisturizes your skin, leaving your skin surface soft and smooth. 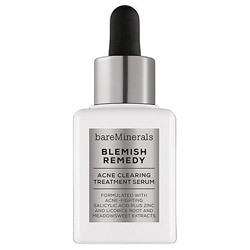 Use bareMinerals Blemish Remedy Acne Clearing Treatment Serum up to thrice daily but, on initial application, gradually work in the product to your regimen to help your skin to adjust. Its salicylic acid content, an ingredient which can be rather irritating to the skin. Apply product only after a fresh cleanse and a thorough toning. The formula is infused with skin lightening ingredients that help correct dark skin imperfections caused by acne marks. The manufacturer fails to disclose the concentration of salicylic acid present in the formula. Salicylic acid is a highly sensitizing ingredient that can cause severe irritations is not used well. The formula contains phenoxyethanol, a neurotoxin, and alcohol and perfume, two of the most irritating ingredients found in skin care products. bareMinerals Blemish Remedy Acne Clearing Treatment Serum contains some of the best ingredients well-known to relieve skin of acne. However, the irritating alcohol and perfume in the formula can cause your skin more harm than good, both in the short term and longer term.